Guys. I went running this morning and I DID NOT STOP ONCE. Okay. So maybe it was a measly mile-and-a-half jaunt around my neighborhood. Baby steps people. If you are one of those running nuts (yes, you are a nut) then shut up that inner monologue you’ve got going on right now. (“That’s a warm-up for me, before the real work begins.” “A mile-and-a-half? I could do that backwards in under 4 minutes.”) Shut it, I say! That’s MY thunder you’re stealing! Give it back!! Running in the morning, no matter how far I don’t go, does wonders for the rest of my day. I feel energized and productive before I’ve even done anything. And if I do get in a slump, I can just be like, wait a second, I ran this morning, I’m not some lame-o stay at home mom youtubing yet another Happy video tribute while stuffing my face with dip. Ima go do stuff. At least it was healthy dip. Lookie! Lentils! Tomatoes! Basil! 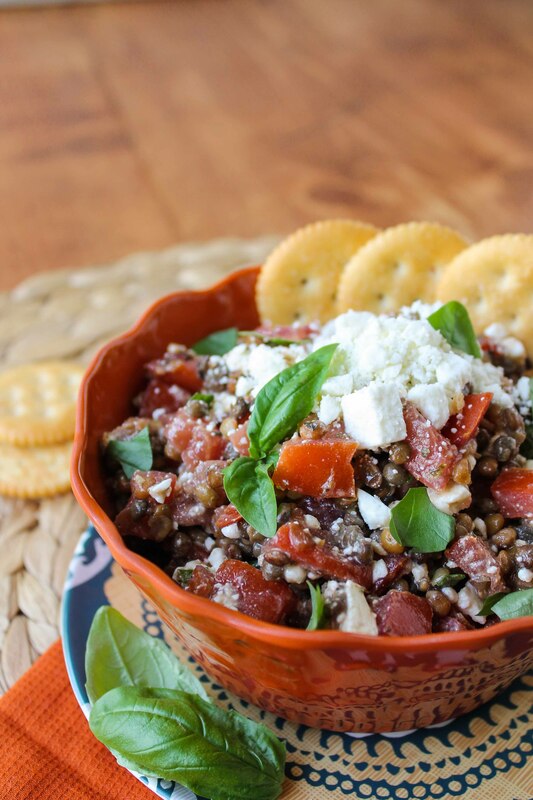 This Fresh Bruschetta and Lentil Dip is sooooo good you guys. I told you I’ve been on a lentil kick lately, I wasn’t lying. My friend served the original version of this dip at our book club a while back and I fell in love. It’s from Trader Joe’s: just a package of their steamed lentils, a tub of pre-made bruschetta topping, and a tub of feta. Thaaaaaat’s it. It works either way. If you live near Trader Joe’s, save yourself a step. If not, just make your own. No big deal. It will be prettier if you use the steamed lentils because they stay firmer, but it doesn’t make that huge of a difference. You can serve this with any kind of cracker. Pitas would be good. I’ve even seen people do sliced cucumber, which would make it super low carb. If you are cooking your own lentils, rinse and drain them in a colander. Bring a large pot of unsalted water to a boil and add the lentils. Boil, covered, until tender but not mushy, about 20-30 minutes. Drain and cool, then refrigerate until chilled. Dice the tomatoes and add them to a large bowl, keeping as much of the juice as you can. Chop the basil leaves and mince the garlic and add it to the bowl. Add the salt, pepper, balsamic vinegar, olive oil, lemon juice, oregano, and basil. Stir with a wooden spoon. 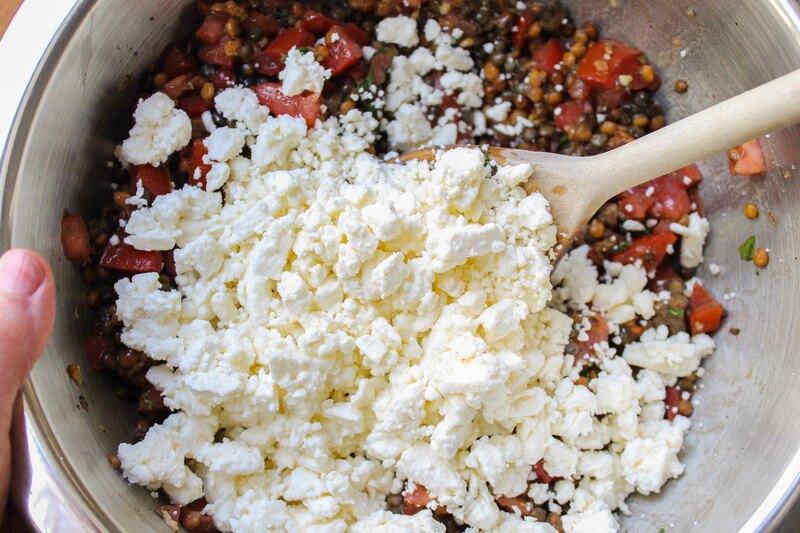 Add the cooled (or pre-packaged) lentils and feta and stir again. Serve with crackers, pitas, on toasted baguettes, or with sliced cucumbers. You can leave out the dried basil if you want, just add more fresh. I eat this stuff with a spoon, so you can totally make this a side dish if you want. 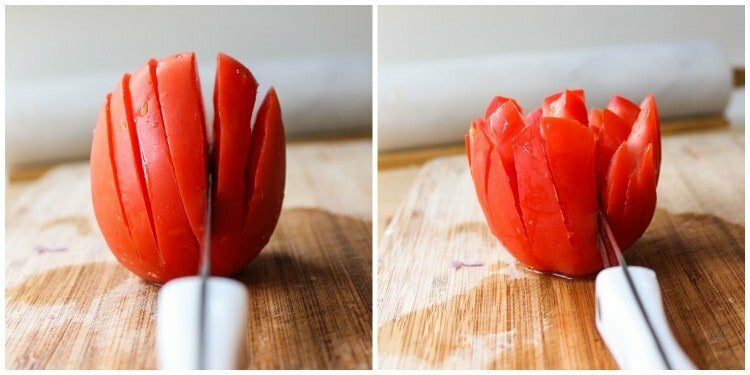 Here’s how I chop tomatoes tiny-like. Next Post » Creamy Strawberry Banana Jello & Blendtec Giveaway! This dip is DELICIOUS!! I doubled the amount of garlic (just because that’s what we like), but otherwise I followed it exactly. It was a huge hit and something that I’ll have on hand all the time. 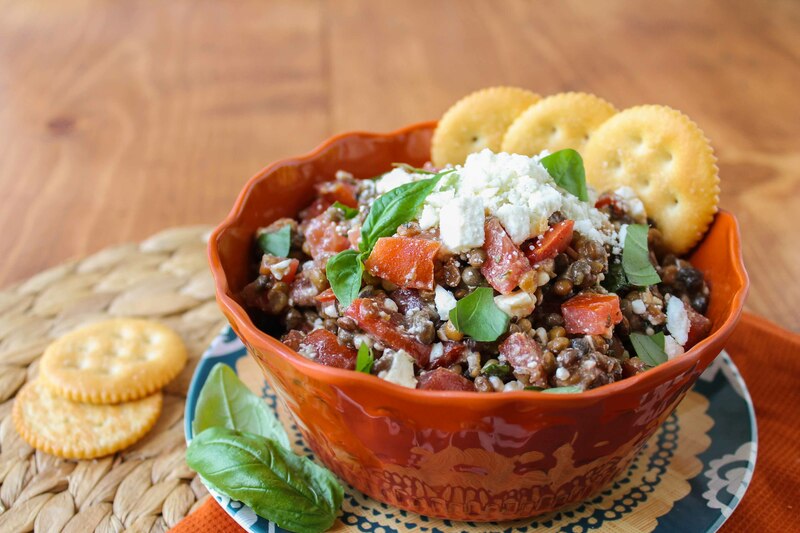 Thank you for sharing this healthy and delicious recipe! 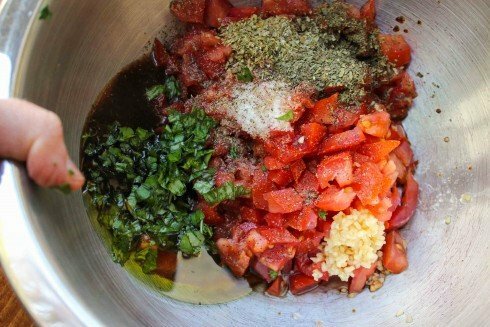 I have made a version of this dip several times, after a good friend shared her sister’s recipe. It always gets rave reviews. And to contain the wholesome goodness when taking some, I use whole wheat scoops. They add a nice crunch, and hold about a Tbsp of the mixture. Yummy! Whole wheat scoops! That sounds like the perfect delivery method for this dip. I will have to try it out next time! I’m so glad you enjoy the dip Carol, thanks so much for leaving a comment! I love hearing from you! Can’t wait to make this! Can I use dried red lentils? I have the kind that come in a red bag from TJs. Thanks!! Hey Mary! Yes you can certainly use red lentils but you have to cook them first! Just boil or steam them however you like until they are tender. Then follow the recipe as usual. I hope you like it! 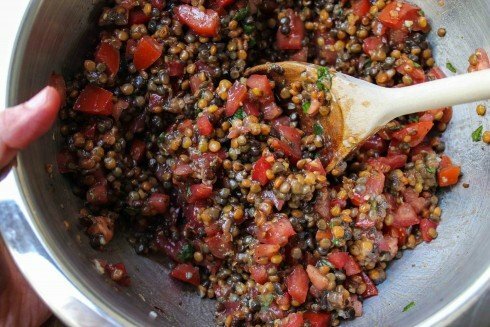 Karen, this lentil dip look fabulous! 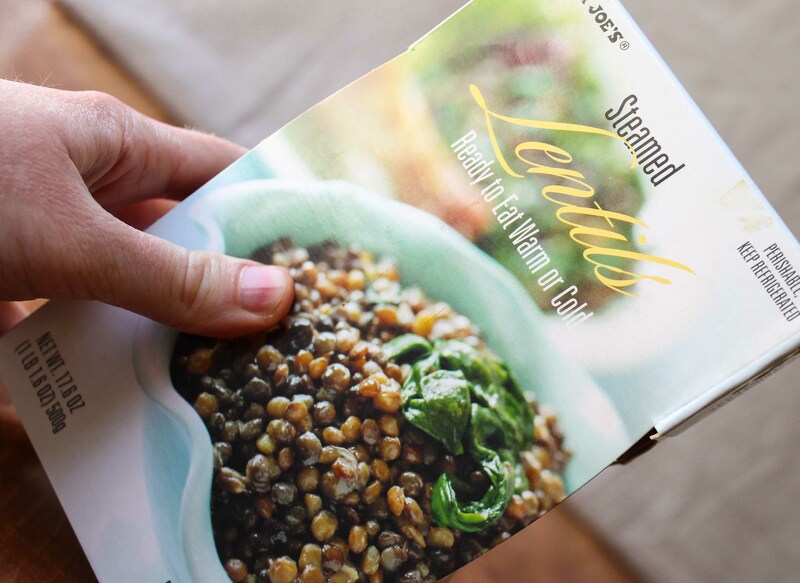 I’m not a lentil eater, but I have them on the grocery list and I’m going to give them a try! Can’t wait to make this recipe soon! I’m really feeling this lentil dip.. I’d dip and keep on dipping girl! Girl, I WISH I could run a mile and a half without stopping! I’m actually training for a 5K right now, so I’ll get there. But running definitely isn’t in my DNA, so it’s a struggle. I am crushing on this dip so, so hard. Definitely the best recipe I’ve seen in a long time. I have a feeling I’d end up just eating it with a spoon! Pinning and making it soon! Hi Karen! First time visiting your beautiful blog. Love it! Thank you for sharing this delicious dip too! I’m right there with you in terms of running…it’s all about the baby steps! I say, YOU are cool. And this looks absolutely amazing! 1) any recipe inspired by TJs is a superb recipe. YAY. 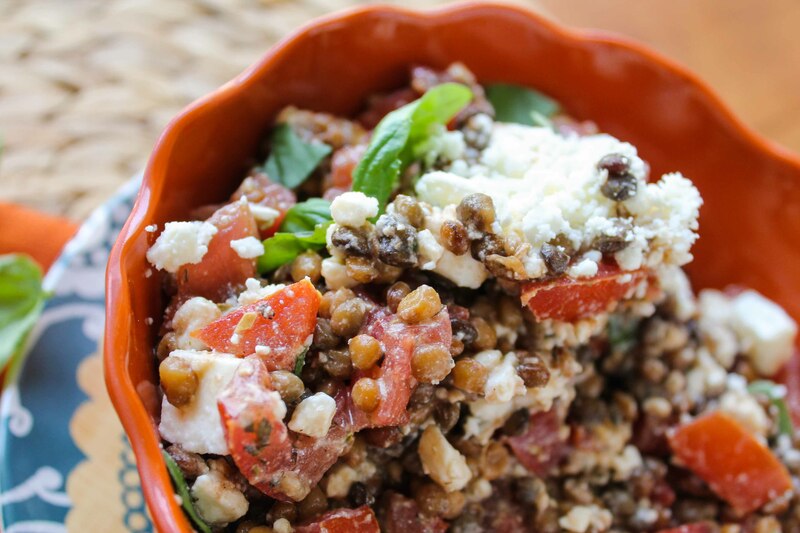 2) how did you know I have a giant tub of feta in my fridge just waiting for this?? Nomm. 3) you just inspired me to waste about 9083745982 minutes watching Happy videos. UGHHHH. So addicting. That one girl in the vest is an AWESOME dancer!! I ran out to the mailbox without stopping the other day and I was feeling pretty proud of myself until you started in with your MILE AND A HALF run. Holy crap, that’s far- yet not so far as to make me doubt your sanity. Your brother, on the other hand, well- let’s just say I have some suspicions. This dip looks awesome. I’ve got thirty tiny heirloom tomato plants that are about an inch high. This summer I will probably eat this dip every single day. EVERY SINGLE DAY. Yum, this looks filling and delicious! And that mile and a half jaunt is a mile and half more than I have ran in the last … oh … years! Two thumbs up on the run! I really need to get back into running, now that the weather has warmed up. Like you said, it really does do wonders for the rest of your day. ;) I could totally see myself going for a run and then coming back to stuff my face with this gorgeous dip! 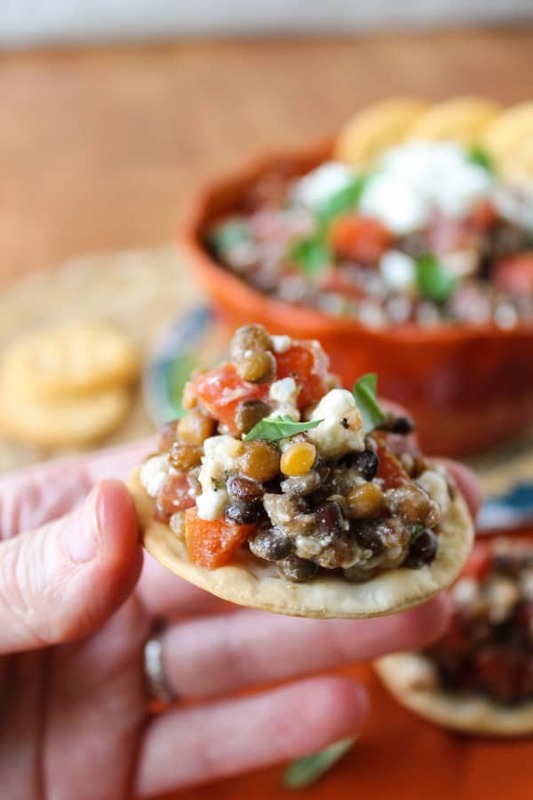 Obviously I’m loving all the feta and the fact that you put bruschetta in a dip! So. Dang. Amazing. Seriously, I don’t even think I would need any chips for this dip. Just put in a bowl and give me an extra-large spoon, please. ;) pinned! My idea of “running” consists of jogging while my dog outruns me, leaving me winded after a half a block. Must have this dip! I feel like it would be ok to eat a whole batch myself since there’s lentils in it… What do you think??? But does your brother cook awesome food and take gorgeous photos of it? ;) I’m with you on running a mile and a half. Maybe. If I’m lucky. And I haven’t run since before I had Wendy, so I doubt I could make it that far currently! Oh my gosh … must have this dip! 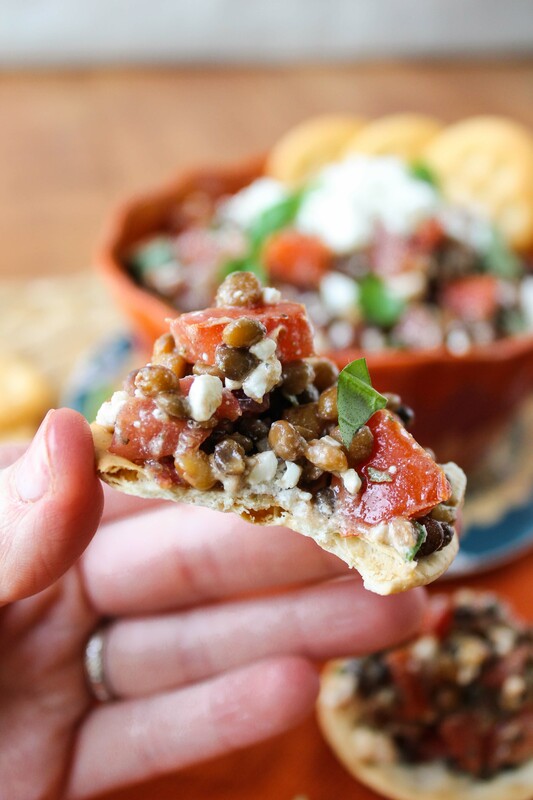 I am on a HUGE lentil kick right now and you combined then with some of my favorites (bruschetta .. feta .. yes yes!). And that’s awesome on running – I’m the same way. I’m trying to get back into running and am very proud of myself for running 20 minutes without stopping to walk : ) So go on girl! Whatever, you’re cool even around your family members. Who else is going to respect you for growing out of the whiny voice you had for fifteen years? I think the most I’ve ever ran is like 5 miles and it only happened one time, lol! A mile and a half is awesome-so go you! I love lentils! This looks Awwesome! I actually really love bruschetta. I love the twist on the classic and the flavours you brought here! Hi Karen, good for you running a mile and a half Yea! 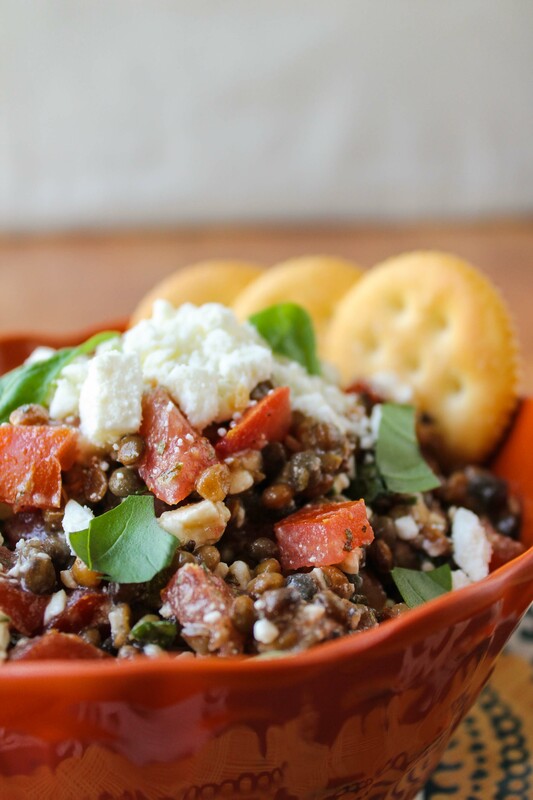 also your lentil dip looks amazing, love the combination. When I read you ran a mile and a half I was thinking “Go Karen!” Um, I would be shocked if I could run a mile without stopping. I HATE running. I’m an elilptical girl. Can’t believe your brother did an Ironman! Gah! This dip looks SO good! After your lentil tacos you inspired me to start using lentils more. And what better way than dip? And thanks for linking to my cheddar curry dip friend! I love to merge cultures. I like this spin of middle eastern and Italian. Fun!